One of your favorite and most decadent snacks has been strongly associated with a reduced risk of stroke. A recent research study from the UK and the Netherlands titled the European Prospective Investigation into Cancer, the EPIC- Norfolk analysis, examined 20,951 men and women. Careful analysis of a food diary distributed to men and women who participated in the study determined that those who reported the highest levels of consistent chocolate consumption experienced lower rates of stroke, while enrolled participants who reported no chocolate consumption or very low chocolate consumption had the highest rates of stroke throughout an almost 20 year follow up period. This study was consistent with several other research studies at different institutions, which also looked at the association between chocolate and stroke risk. A large analysis from Sweden followed 37,103 Swedish men for ten years. The Swedish results similarly showed that those who reported the highest chocolate consumption, averaging 62.9 grams per week, were the group who had the lowest stroke risk. An even larger investigation examined a bigger group, a total of 157, 809 participants from nine different studies, and confirmed the same trend. How much chocolate should you eat to protect yourself from stroke? The research investigations were pretty consistent in reporting that the highest group’s chocolate consumption was measured between 16-99 grams of chocolate per day, which is about half an ounce to 3.5 ounces per day. That is the equivalent of eating between 10 chocolate chips per day up to one regular size chocolate bar, or a few snack size chocolate bars per day. 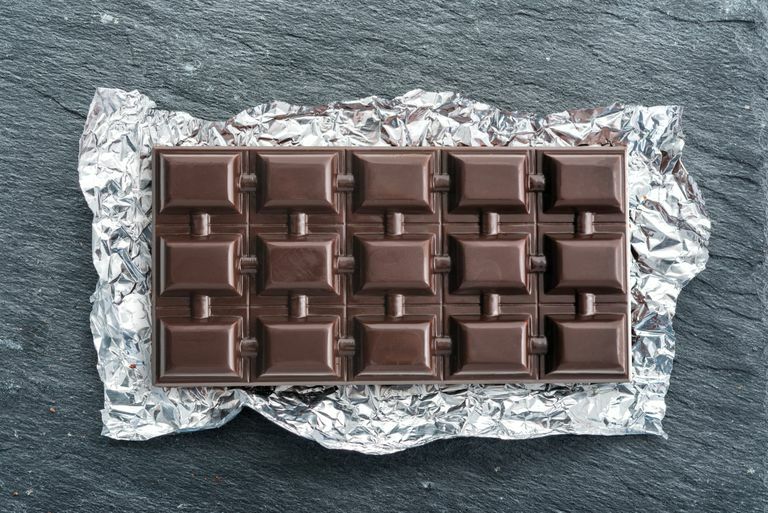 What kind of chocolate helps protect against stroke? The benefits of chocolate are found in both milk chocolate and dark chocolate. But this is where it gets a little tricky. The healthy effects specifically come from chocolate produced by the cocoa plant, not from imitation chocolate flavoring, food coloring, artificial chocolate smells or sugars. Read labels because many chocolate flavored snacks and candies do not contain actual chocolate made with cocoa. Instead, some processed chocolate flavored products are made with small amounts of chocolate and are passed off as chocolate because they contain food coloring and other additives that can make them resemble chocolate. Dark chocolate and milk chocolate are both made from cocoa, while white chocolate is not made with the same cocoa ingredients that protect against stroke. Why does chocolate protect you from a stroke? Chocolate is a tasty treat, but when you eat it, the cocoa in chocolate also has several biological and chemical effects on your body. These biochemical actions include protecting the inside lining of your blood vessels, which works to prevent stickiness that contributes to the formation of harmful blood clots. Blood clots in the brain cause ischemic strokes. Healthy blood vessels are also more resistant to the risk of tearing and leaking that results in sudden bleeding. Thus, cocoa serves to protect you from another type of stroke, which is a hemorrhagic stroke. Additionally, cocoa beans have been scientifically proven to provide anti-oxidant effects, which is important in counteracting the toxic brain damage induced by a stroke. Chocolate has been established as a means to reduce feelings of stress and the perception of stress. Severe stress increases your risk of stroke, and the long-term buildup of chronic stress also raises the likelihood that you will have a stroke. The best news about stroke prevention is that is isn't expensive, unusual or hard to do. A variety of easy and enjoyable life style modifications can go a long way in reducing your risk of stroke. Eating and sharing moderate amounts of chocolate just might be the most pleasant way to protect yourself and your loved ones from having a stroke. If you want to learn more about how you can be a part of scientific studies like the chocolate studies, find out more here.